One of the persons who came to my rescue was the one who had introduced me to this artist initially. She told me, one should not try to include too many elements in my cover. It should be restricted to 1-2 elements only. So, she suggested keeping the top half of the cover and using the entire bottom half just for the title. I told her of my woes dealing with the designer. She offered to intercede on my behalf and get a final one done as per her suggestion. But I have a personal preference for a detailed work with lot of elements. I don’t like simple or abstract works all that much. And I wanted my cover to be unique and stand out. Which is a risk of sorts. Being like everyone else is safer. Being different increases probability of both extremes – utter rejection of the idea as childish fancies as well as capturing the imagination of the audience with something never seen before. However, I decided to take part of her idea – having the title at the bottom instead of in the middle interfering with the drawings. Another friend had asked why author’s name was repeated twice. 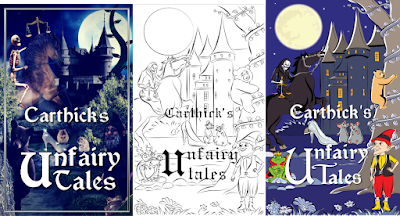 I had titled the book ‘Carthick’s Fairy Tales’ along the lines of ‘Grimm’s’ Fairy Tales’. So author name was probably redundant when it is part of the title. So I decided to cut it from the cover to reduce the clutter. I had the title moved down, bringing focus on the top part. And in the bottom part, I decided to have the various elements arranged around the title – the mice in between the title and the frog, hobgoblin and the bear on 3 of the 4 sides. That way, the title also gets attention. So I went back to the designer with these ideas, hoping she doesn’t demand $20 more. But luckily she agreed, there being no request for new elements to be added. So, a fourth cover came out. I ran it through people. It was more or less there except for the title not being so much readable in the glowing color. Pure white, while less fancy increased readability. 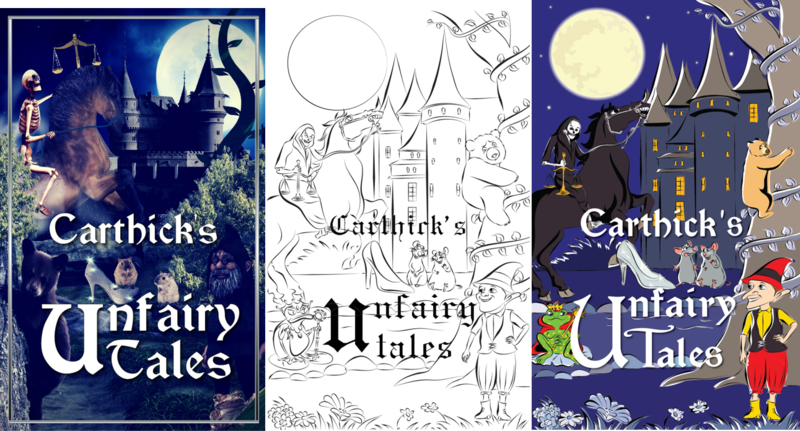 By now I had already paid her and obtained the final versions of the cover – a set of 3 files - .png, .jpeg and 3 D format. I went back to her for change in color of title. She agreed to that as well luckily. However, there was still a niggling feeling that the cover was looking like a homemade collage with all the stock images. And the other concern was people who liked it thought it was ‘creepy’. I began to fear the picture was misleading and conveying a wrong impression that the book belonged to the horror genre. But I had already had enough of the cover and decided to march on ahead. But at the point when the book was almost finalized, a writer friend popped up and said you are putting so much effort for the book - doesn’t it deserve a better cover than this? He was insistent that I could get a much better cover for half the amount I had spent. That brought all my doubts back to the fore and I could not go ahead after such an adverse feedback. But I decided to seek a neutral opinion before deciding anything as I felt writers may be biased by their personal preferences. So, I sought a friend who I felt will like the genre I am writing and whose opinions I had not sought before and hence likely to come with a fresh mind. Initially she tried to be diplomatic but on probing further she confirmed my worst fears – the cover would not do. What was I to do now? I had prepared banners and was all ready for the cover reveal and now I discover there is a problem with the cover. The same lady who delivered the final death blow on the cover came up with a suggestion – she came up with a recommendation of an artist and even connected me to her. I called up the new artist. She was interested in the assignment but she would charge 3 times of my original budget. So, my final cost would be 5 times of what I had planned. But I was now way past caring about costs. There was a problem and it had to be fixed. That is all there was in my mind. I agreed and got her started giving her the old cover as a base and with the brief that the elements of the picture should synchronize more with each other and any horror look should be eliminated. I also gave changed specifications for some of the elements as we were no longer bound by availability of stock images. She asked for 10 days’ time which I was happy to give her as my cover reveal was exactly 10 days’ away. But she came back to me the very same day with a black and white drawing seeking approval to go ahead and color it. I once again decided to consult folks. I was looking for some incremental tweaks and encouragement. Instead once again I got a most disruptive feedback from one of the persons whose opinions I respected the most. He again suggested not having so many elements and sticking to one element. But I was not keen to abandon all those elements after coming all this way. So, he suggested I keep one element and put the others on a painting and hang it on a wall. I really like the idea – that of a story within a story. That seemed unique and interesting. The artist was not very enthusiastic about the new idea but she agreed to give it a try. It helped a lot to have an Indian designer on phone than a foreign designer on mail. One could talk out so many things. The next day she was back with a revised version of the drawing incorporating some of my feedback as well as the one with the new concept. The new one was nice but clearly the painting stuck out like a sore thumb. The obvious solution was to eliminate the painting and go with a single concept. But while I am generally pliant by nature, some things I just don’t want to let go. I just didn’t want a simple plain cover like most in the market. Definitely not after all this struggle. I wanted an intriguing one with lot of elements and I would have nothing other than that. So, I asked her to go ahead and paint the one with the original concept. After the painting, there were few more iterations - on colors of objects, placement of title and such. And finally, I had my cover. All over a weekend. I really enjoyed the hectic parlays over those two days culminating in a cover I have come to fall in love with. I don’t know how the market will receive this cover. So far, the reception has been decent. But if it does not work out as I hope, I feel rather than go for simple covers like most in the market, I would go the full hog and just pick the free ones given by Amazon itself. Why even bother with the covers if it is going to be like that of every other book in the market. I can at least save a huge amount of money. That does appear cluttered, but just as Steve Jobs would say, follow your heart and intuition. Thanks for the feedback, Umashankar. I need to see if my heart and intuition has worked or not.